Clackamas turned back an early threat from Grants Pass to score a 6-2 win in the 6A softball quarterfinals Friday night. 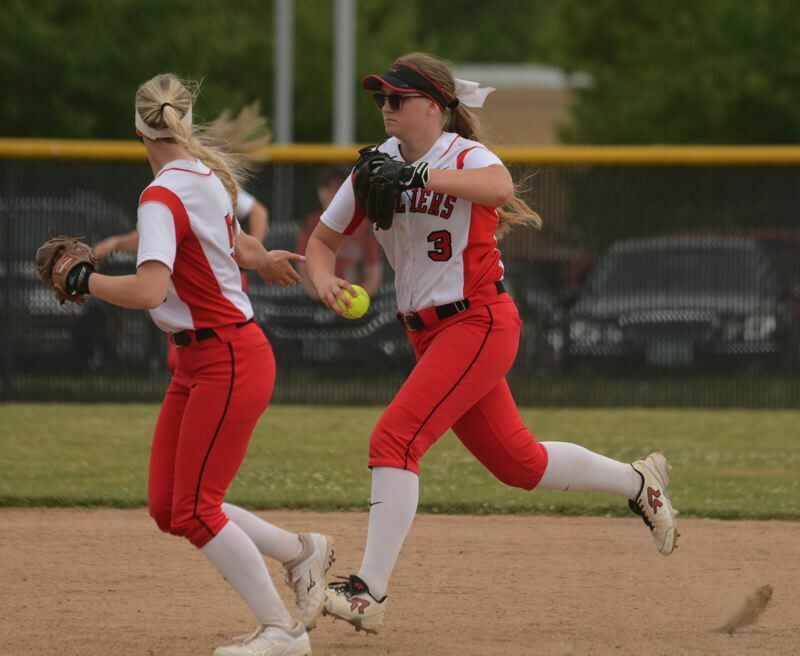 After trading runs through the first two innings, the visiting Cavemen were on the verge of taking the lead when Alyssa Etheridge sent a fly ball to right field with two runners on base. Joey Miller came up with a clean catch and was quick to fire the ball back to the infield, forcing the Cavemen's lead runner Haley Dougherty to hit the brakes halfway home from third. Still, Grants Pass tried to unlock the door when fellow base runner Grace Gaither took a jump off first base, daring Clackamas to make a play. The Cavaliers didn't take the bait. Catcher Kylie Hegar walked the ball home, keeping a steady eye on Dougherty the entire way. Next up was Brooklyn Hurd, who sent another deep ball to right field this time putting Miller on the run, coming forward several strides before reaching her glove out in front for a tricky waist-high catch that stranded runners at second and third. "I realized I probably should have flipped my glove over, but it was too late — I guess that's what two hands are for," Miller laughed. "I was confident I would catch the ball — I had no doubt. I had to make that play for our team." Clackamas would surge in front to stay in the bottom of the third, putting runners on the corners when Hegar reached safely on a bunt. Kylee Vanderbout sent the next pitch down the left-field line to bring Ellie Martin across for the go-ahead run. Two batters later, Olivia Musso hit one through the right side that gave Hegar just enough time to slide home for a 3-1 lead. "Luckily, their catcher bobbled the ball and we were able to squeeze one out," Hegar said. "We got a rally going, everyone started hitting and it got exciting." 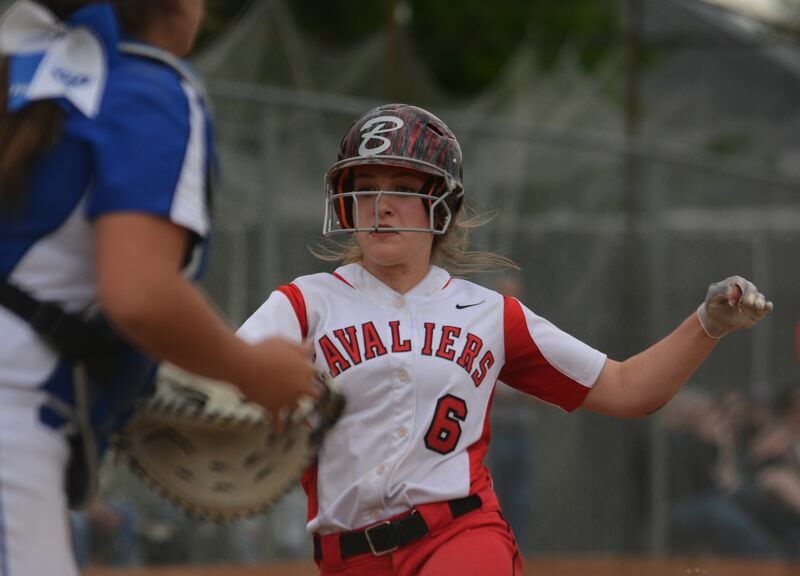 The Cavaliers appeared to score another one on Miller's sacrifice fly to right field, but it was ruled that the team's lead runner left third base too soon and her run was taken off the scoreboard after Grants Pass appealed the play. No matter. 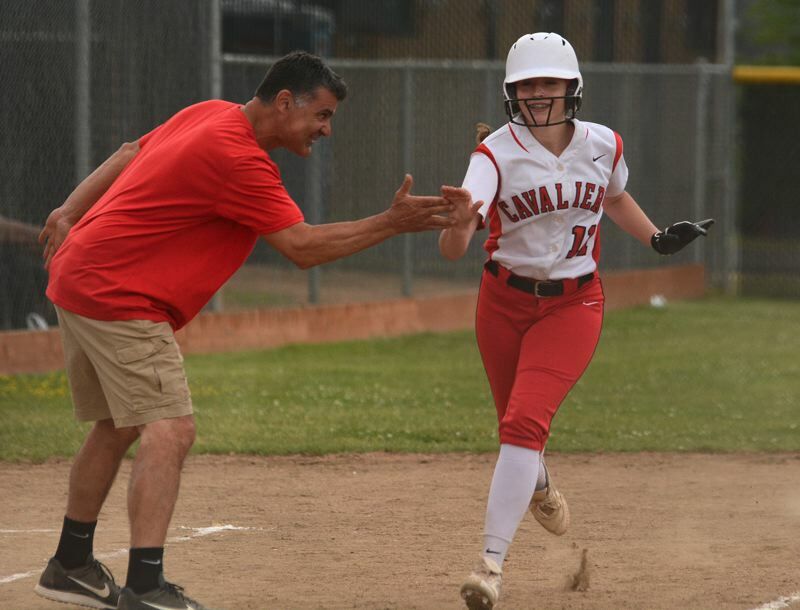 Clackamas would get that run back with two outs in the fourth when Shaylee Monise sent a deep ball to straight-away center field clearing a fielder's glove that was poking just above the yellow tubing across the top of the wall for a solo home run. "I saw it go over on my way to second base and I got really excited," Monise said. "That wiped out the homer I gave them earlier in the game." Miller would knock a two-run homer out of the park in the fifth inning to put the Cavaliers in command 6-1. Hurd answered with a homer for the Cavemen in the sixth, but Grants Pass couldn't get the tying run out of the on-deck circle in the seventh. Trinity Loeb moved in under a tall fly ball behind second base to end the game. No. 2-ranked Clackamas (25-5) advances to play No. 3 North Medford (25-4) at home in the semifinals at 4:30 p.m. Tuesday. "We played fantastic today," Clackamas coach Ken Gemma said. "If we hit like we did today and play tough defense, we can play with anyone in the state." The Cavaliers' outfield killed any chance for a Grants Pass comeback, starting in the fourth inning when Kaelyn Lawrence slid on her hip for a catch in shallow center field to get the lead-off hitter. In the fifth, Loeb came up with back-to-back catches in left field to end the inning, the second grab coming with her back against the fence.